Shop at Amazon.com: On the right side (main page) of our site is a banner for Amazon.com (smile.amazon.com). 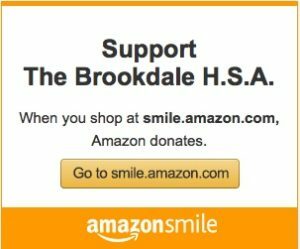 By clicking that banner before you shop, Amazon.com will send the HSA a percentage of what you spend on the site. We welcome ideas for new ways to raise funds for Brookdale. Please feel free to contact the board if you have an idea. As always, if you have any questions, please contact us!